Taking Aim! The Business of Being an Artist Today is a practical, affordable resource guide filled with invaluable advice for the emerging artist. The book is specially designed to aid visual artists in furtheringtheir careers through unfiltered information about the business practices and idiosyncrasies of the contemporary art world. It demystifies often daunting and opaque practices through first-hand testimonials, interviews, and commentary from leading artists, curators, gallerists, collectors, critics, art consultants, arts administrators, art fair directors, auction house experts, and other art world luminaries. 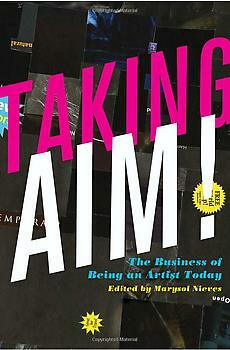 Published in celebration of the 30th anniversary of Artist in the Marketplace (AIM)-the pioneering career development program at the Bronx Museum of the Arts-Taking AIM! The Business of Being an Artist Today mirrors the structure and topics featured in the AIM program's weekly workshops and discussions. Each chapter focuses on the specific perspective of an art world insider-from the artist to the public art program director to the blogger. Multiple viewpoints from a range of art professionals provide emerging artists with candid, uncensored information and tools to help them better understand this complex field and develop strategies for building and sustaining successful careers as professional artists. The book ends with an annotated chronology of the past three decades in the contemporary art field and a bibliography of publications, magazine articles, online sources, funding sources, residency programs, and other useful information for emerging artists.